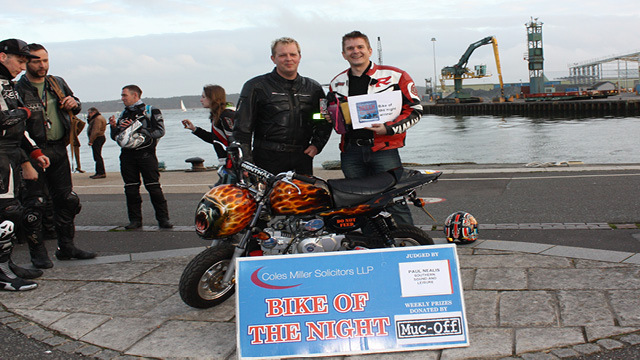 After the disappointing weather last week, Poole Quay was blessed with glorious sunshine and around 800 bikers parked up to soak up the atmosphereat the latest Coles Miller Solicitors Dream Machines. The main site was close to being full as many ventured out to enjoy the evening sun. Congratulations to Alan Dunkerly from Ringwood, who won the 'Bike of the Night' title on his Skyteam Gorilla 125cc. The judge for the evening was Paul Nealis, from Southern Sound and Leisure. Paul chose this machine from the extensive line up because of the attention to detail including the custom paint work. The Skyteam Gorilla 125cc was built for charity and is collectively owned by staff and mechanics at BLD Group.